We apologize that we did not perform the “gold standard” method of measuring CBF—133Xenon SPECT. Nonetheless, we think that the “hyperfixation of HMPAO” is not caused by high CBF (hyperperfusion), but occurs in an area of low to slightly high CBF where the trapping of HMPAO is enhanced. First, the HMPAO SPECTs were performed in our study (1) 4 hours (case 1), 2, 6, and 19 days (case 2), 17 days (case 3), and 5 and 16 days (case 4) after the onset of stroke, respectively. The paradoxical hyperfixation appeared in every stage in cerebral infarction: extremely acute stage (4 hours in case 1); earlier acute stage (2 days in case 2); delayed acute stage (6 days in case 2, 5 days in case 4); and subacute stage (19 days in case 2, 17 days in case 3, and 16 days in case 4). In case 1, the radiotracer counts in the region of interest (ROI) in the area of HMPAO hyperfixation and the corresponding region of the contralateral hemisphere averaged 195.3±17.6 vs 42.7±1.4 and 145.3±10.0 vs 41.3±3.0, respectively (1). The tracer counts of ROIs in hyperfixation are four to five times higher than those of the normal region. True CBF of reperfusion hyperemia cannot be so much. In case 2, on day 3, 2 days after the onset of stroke of the left middle cerebral artery (MCA), HMPAO SPECT showed unexpected hyperfixation in the left hemisphere (Fig 1A) during the period when the patient deteriorated to deep coma and required intubation. Clinical manifestations did not suggest recanalization in case 2 on day 3. Moreover, the HMPAO hyperfixation in the area of infarct persisted for a long time—2 days (Fig 1A), 6 days (Fig 1B), and 19 days (Fig 1C) after stroke onset. On day 13, cerebral angiography revealed normal filling of the MCAs and anterior cerebral arteries bilaterally suggesting recanalization of the left MCA. Clinical manifestations and angiographic findings suggested that recanalization occurred between day 4 and 13. Serial hyperfixations of HMPAO in case 2 were not attributed to recanalization of the vessels. FIG 1. HMPAO SPECT 2 days (A), 6 days (B), and 19 days (C) after stroke onset (Case 2). FIG 2. Angiography shows occlusion of the temporopareital branch of the MCA (Case 3). Likewise, in case 3, cerebral angiography revealed the occlusion of the temporoparietal branch of the left MCA without evidence of recanalization (Fig 2). We think that hyperfixation can occur in all stages of infarction, and does not appear to depend on recanalization (1). 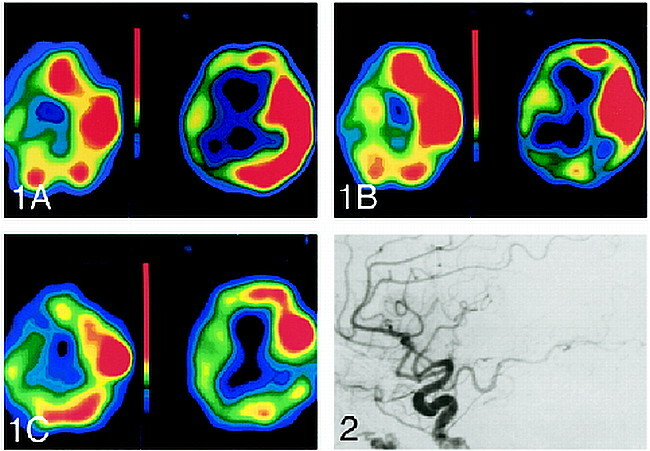 The mechanism of HMPAO hyperfixation in infarction is not known. 99mTc-d, 1-HMPAO is the first clinically available 99mTc-labeled CBF retention tracer. The cerebral retention of 99mTc-HMPAO is believed to involve the intracellular conversion of the hydrophobic Tc-HMPAO to a species that is incapable of rapid back diffusion (2). The proposed mechanism of this conversion is thought to involve interaction of 99mTc-HMPAO with glutathione (GSH) (3). GSH is responsible for intracellular trapping. Neirinckx et al suggested the accumulation of 99mTc-meso-HMPAO was dependent more on GSH content than blood flow (4). In acute and subacute stages of cerebral infarction, increased GSH levels may result in increased HMPAO retention. Spurious hyperfixations in cerebral infarction probably happen less in 99m Tc-ECD and Iodine-123-iodoamphetamine SPECTs than in HMPAO SPECT.